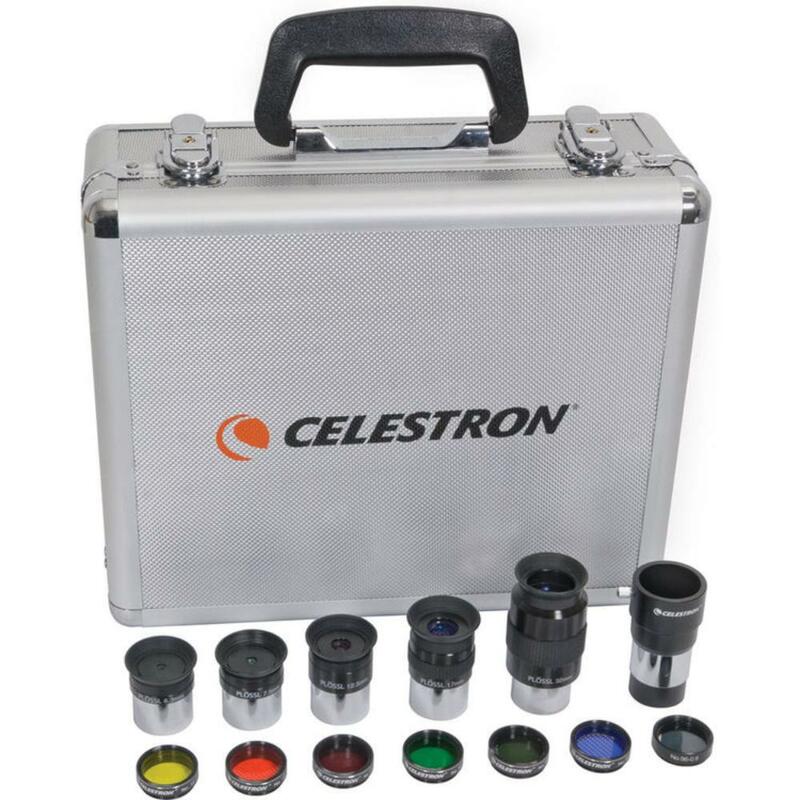 The Celestron Telescope 1.25" Eyepiece and Filter Kit comes with 5 eyepieces of varying powers and fields of view to attach to a Celestron NexStar 6SE 1500mm Telescope or Celestron NexStar 4SE 1325mm Telescope. It also comes with 6 color filters, an ND filter to decrease moon brightness, and a barlow lens to double the power of any eyepiece. Each eyepiece features a four-element design with a 52º apparent field of view. The optics are fully multi-coated to improve light transmission. The 32mm Plossl eyepiece offers a low power, wide field view in most telescopes, the 13mm and 17mm focal lengths are good medium-power oculars, and the 8mm and 6mm eyepieces provide high magnifications and are great for the Moon and planets, especially when seeing conditions are good. The included filters will enhance your astro imagery. The blue increases contrast of the cloud belts on Jupiter and the polar ice caps on Saturn. It also can be used to increase contrast on the Moon if you don’t mind the color shift. The orange sharpens the boundaries along the plains of Mars due to the reduction of blue/green transmissions. Use on Jupiter and Saturn to enhance detail in the belts and polar regions. The yellow is a good general-purpose filter for smaller aperture telescopes, like the 4" diameter Celestron NexStar 4SE 1325mm Telescope. It will improve the contrast of features on the Moon and also help you see the equatorial belts on Jupiter and Saturn, clouds and the polar ice caps on Mars, and the dusky detail on Uranus and Neptune. The neutral density filter stacks well with the other filters to increase density without actually changing the color. It can be also used alone to decrease the brightness of the Moon. The Barlow Lens will double the magnification of any 1.25" eyepiece. Simply install the Barlow between the eyepiece and the eyepiece holder of your telescope. You can also sandwich the Barlow between your telescope's eyepiece and a T-Ring (which comes with the rental of a Celestron telescope and allows you to connect a DSLR to the telescope for astrophotography). To do this, remove the black lens assembly from the bottom of the Barlow by unthreading it from the silver barrel. Insert the silver barrel into your telescope’s eyepiece holder and secure it well using the set screws. Thread a T-Ring (included with telescope rental, not this rental) onto the large threads at the back of the Barlow. Now attach your DSLR camera to the T-Ring. To focus the camera, use the telescope’s focus knob while looking through the viewfinder or by using “live preview” mode (if supported). 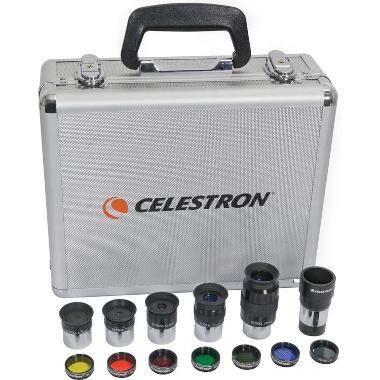 This kit is essential for astrophotographers and backyard astronomers as well as students and teachers. • It is also compatible with any telescope eyepiece that is 1.25" but experiment at your own risk. • Do not use any filter in this kit for solar viewing. • For more on installation, please see this guide.